Plan to have dinner with your family this Monday, September 27, 2010 as part of CASA's National Family Dinner Day. I know this is preaching to the choir, because many readers and followers are having dinner with their families (almost) every night anyway. Still, take a moment to reflect on why family dinner is important to you and to pat yourself on the back for making the effort for yourself and your family. Then, think about what we can do to promote family dinner more widely. The media laments that "no one" eats dinner together anymore and that our busy lives are to blame. There are periodic news stories or articles that run down the statistics on why it is important for kids and their families to have meals together and gloss over the various barriers to family dinner: technology, work schedules, sports schedules, commuting, to name a few. Yet, those who actually have dinner with their families can feel isolated, as if modern busy families are all too focused on other tasks to bother with the routine of family dinner. I have had many people thank me for working on this issue, for publicly supporting family dinner as important. I almost feel like "family dinner" is in the closet. The people who have family dinner are loathe to talk about it, feeling perhaps like they represent some throw-back, traditional family or that they would be "bragging" to admit this special feat. Then families who aren't able to swing dinner together very often, for whatever reason, may feel guilty or defensive that they aren't meeting some "family dinner standard." So they don't want to talk about it either. "Gosh, you must have such a boring, un-busy life if you can manage family dinner every night. Do you wear an apron too?" "Do you realize that not having dinner every night with your kids will doom them to failure for life?! Little Johnny will probably be doing drugs by the time he is 10. Are you ready to live with that?" "Only well-off, upper middle classes families can afford the time and money it takes to put family dinner together." "Only low-income immigrant families eat dinner together." "My kids need sports and afterschool activities to be healthy and competitive in high school and college. These things are good for them; how can they possibly do both?" Guilt, as the new age gurus say, is a useless emotion, though one that I, as a lapsed Catholic who married a Jew, know a lot about. Family dinner is not about guilt; it's not even about doing what's right for your kids, although that is a happy side bonus. I think it's what's right for mom and dad too as part of building a family life. My motto is: try family dinner, make it a priority, give it a chance. 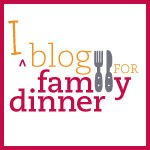 Talk about it, share stories and support and recipes with other families. Family dinner norms for 2010 are not a "Norman Rockwell" scene, but something quite different. It's about finding that happy medium of "busy, yet got your priorities straight," a balance that seems so hard to manage for parents today. The bottom line is: Many families are not eating dinner together and we need to decipher why not. There are obvious reasons: families are busy and crunched for time and money. But like the obesity paradox, where low income families who do not have enough food are also likely to be obese rather than stick-thin, I think there is more to it than that. From a public health perspective, more can and should be done to influence, support, and encourage families at all income levels to make the effort to create healthy family dinner traditions. So promote National Family Dinner Day (09.27.10), live what you preach and spread the message.